We were in bed and asleep by the time the ferry left Trabzon and we awoke to blue skys and calm seas, wtich was very welcome. We are right in the center of the ship and despite the mill pond of a sea its hard to walk straight in the van as the ferry rolls from side to side at any opportunity. We’d hate to be on it in heavy seas! 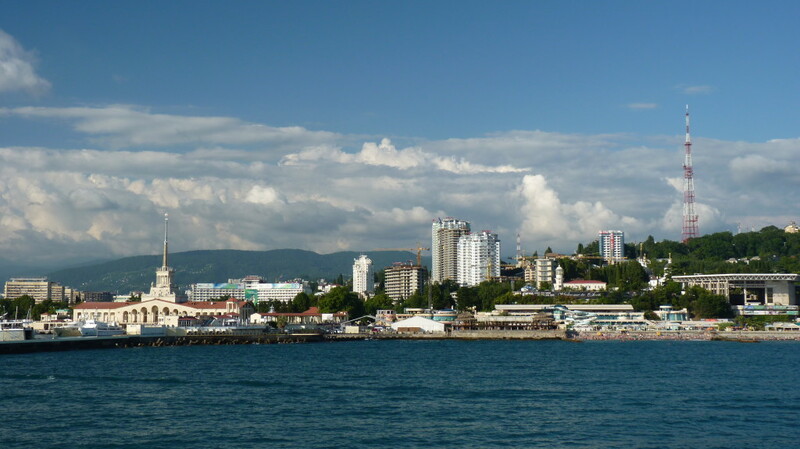 We arrived in Sochi at around 17:30 and then began the somewhat slow process of clearing customs. First the footies are seen at the bottom of the car deck ramp but not allowed to set foot on Russian soil, then almost like starting a horse race they are given the signal and they rush to form a queue at the customs building losing one or two of the elderly over the edge of the quay in the melee. Next foreigners in cars are seen. Strangely there were 3 German guys all travelling on their own, and two Turks all of them on beasty bikes plus a Georgian car with a Russian girl and a Turkish partner who could only communicate in English! The common language was English and 5 hours after everyone else had long gone home we were the mobile canteen providing food and drinks to all. In the end after dropping the colleague routine in we were cleared at midnight! We went 10m and couldn’t get any further as the car park was jammed and had to wait another 20 minutes for the cars to get moved but tired and in the dark and in the Las Vegas of Russia with the whole place heaving with cars and people and thumping music blaring out of every building glitzy lights covering every inch and palm trees swaying gently to the beat, we had arrived!